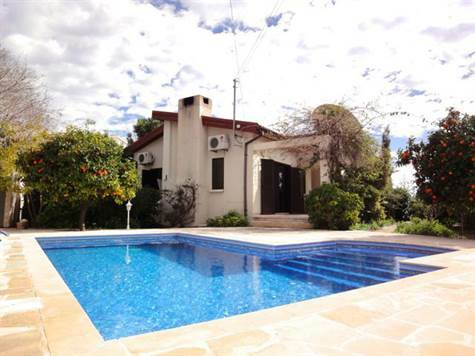 Cyprus Property Blog by Cleo : Bungalow in Tala - Price Just Reduced! Tala, Paphos - This character property is ideally located within walking distance to the traditional village square of Tala. The property is a mixture of old and new. Original features include wooden beamed ceilings and wooden architraves and doors. There is a wood burning fire in the lounge with a back boiler system providing heating. When the fire is not lit and heating is required, the gas central heating system is used. New features include a stylish kitchen with built-in oven, gas hob, stainless steel cooker hood, fridge/freezer and integrated dishwasher. A matching island is cleverly designed to move easily thus provide flexibility for formal and informal dining. Both the main bathroom and the en-suite shower room off the master bedroom are modern with good finishes. This is a really comfortable home and has a lovely cottage feel. Attractive stone arches separate the living room from the large kitchen and dining room. Both bedrooms are double size and have fitted wardrobes and patio doors providing easy access to a raised veranda. A loft/storage space can be accessed from either room. Being a large plot there is lots of outside space and there are verandas on 3 sides of the property. Landscaped gardens include a variety of shrubs and fruit trees teeming with fruits. The swimming pool terrace is fabulous for sunbathing and roman steps provide easy access to the L-shaped pool. A one storey traditional village house in front ensures the great sea views. The property has full title deeds and is fully furnished. Please refer to MLS #: 1084 when inquiring.